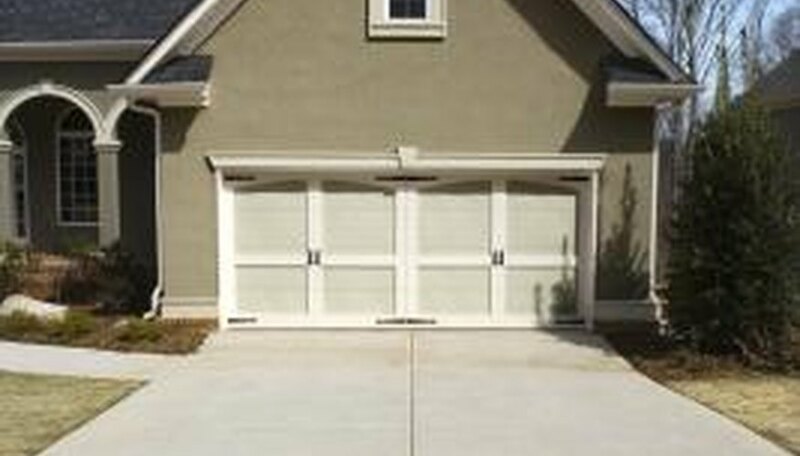 A gap between a driveway slab and a garage is a threat to the home’s foundation. If left unsealed, water will seep through, damaging the foundation and causing cracks when temperatures drop. Fixing this gap is not complicated. Filling the gap with an expansion joint will prevent water damage and allow concrete to expand and contract as needed to prevent cracks. Brush out the inside of the gap with a stiff-bristle brush, removing any sticks, leaves and other debris. Measure the depth and width of the gap with measuring tape. Unroll a length of foam backer rod equal to the length and width of the gap. Cut the foam to fit with a sharp utility knife. The foam backer rod is strong and durable so it can withstand harsh weather conditions and the stress of daily use. The expansion joint must be at least 1/4 inch wide. Press the foam backer rod into the gap with your hands. When you feel resistance, lay a wood board over the foam and hit the board with a rubber mallet to push the foam in all the way. Use a caulking gun to apply the sealant over the foam backer rod until its level with the surface of the driveway and garage. Smooth it level with the driveway and garage with a trowel. Continue to caulk around the side edges so there are no gaps remaining between surfaces of the driveway edging. Scoop concrete vinyl patch compound with a putty knife into any gaps that are too small to fill with foam backer rod. Smooth it down with the trowel. Once it dries, use a paint brush to apply a coat of sealant over the patch.